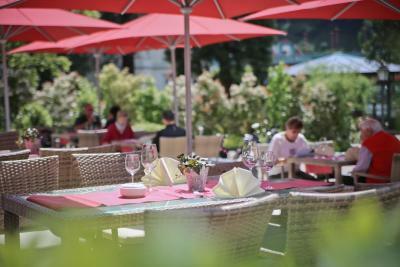 Lock in a great price for Hotel Moselschlösschen – rated 9.1 by recent guests! Breakfast was amazing, the lawn chairs in the garden were very nice for taking an afternoon nap. The room was wonderful, but rather hot this time of the year. The staff was very helpful with finding churches nearby. 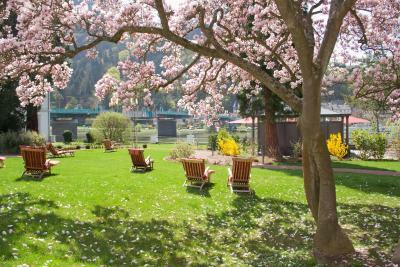 All in all wonderful stay at a beautiful Mosel hotel! Excellent breakfast. Train to Trier just a few minutes walk. Definitely a worthwhile day trip. River boat to Bernkastel fabulous. Great architechture! Region full of fantasy and imagination. A very nice hotel, with a beautiful interior design all through the building. Staff was professional and very nice, services were great. The room was spacious and beautiful with picturesque view to the Mosel and the Grevenburg Castel ruins. Breakfast was excellent too, with great variety and delicious and fresh offerings. They were prepared to serve also for ones with lactose intolerance or specific diet. I was upgraded to a suite and the staff were absolutely delightful. The people on reception could not have been more helpful. 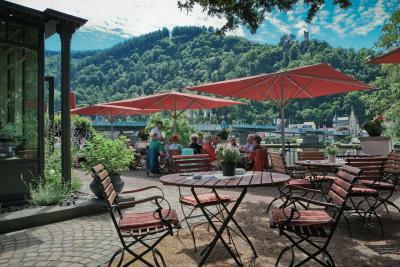 The staff was very friendly; the location on the banks of the Mosel is very nice. Lovely location, great service and all you could ask for! Eigenlijk alles het was een zeer goed en proper hotel en aan het onthaal waren ze zeer vriendelijk hebben ons zelfs mee naar de kamer begeleid. De bediening in het restaurant was ook heel goed. Hotel Moselschlösschen This rating is a reflection of how the property compares to the industry standard when it comes to price, facilities and services available. It's based on a self-evaluation by the property. Use this rating to help choose your stay! 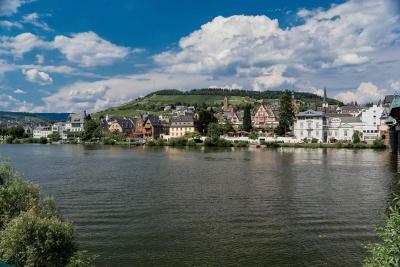 One of our top picks in Traben-Trarbach.Located on the banks of the Moselle, just a 5-minute walk from Traben Train Station, this historic hotel in Traben-Trarbach is perfect for relaxing holidays and wine tasting sessions. 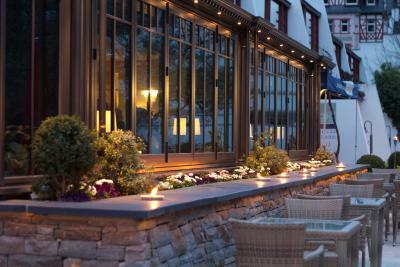 Once home to a wine merchant’s family, the Hotel Moselschlößchen now houses spacious rooms and suites with free Wi-Fi. 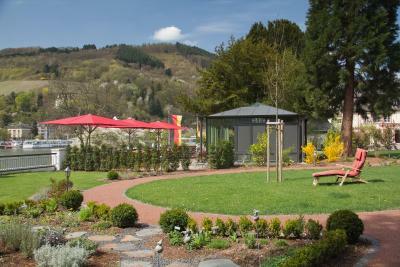 Rooms are located in different buildings, offering views of the Moselle or the park. After a long day exploring the picturesque surroundings, return to the Hotel Moselschlößchen for a relaxing massage or cosmetic treatment. Nordic walking sticks are also available at reception. 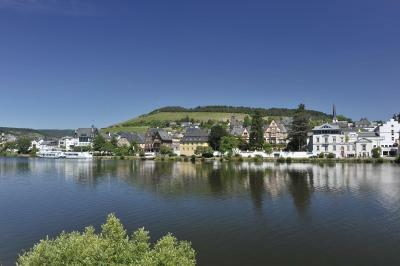 This is our guests' favorite part of Traben-Trarbach, according to independent reviews. 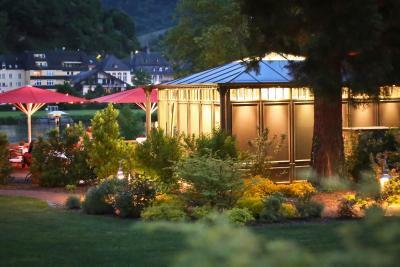 This property also has one of the top-rated locations in Traben-Trarbach! Guests are happier about it compared to other properties in the area. When would you like to stay at Hotel Moselschlösschen? Faces the River Moselle or the park. These elegant suites are located in the half-timbered building. Some of the suites in the villa are maisonette-style. The suites face the Moselle or else the terrace. Features a view of the River Moselle. The rooms are in maisonette style. The living and sleeping areas are separated by a spiral staircase with about 20 steps. House Rules Hotel Moselschlösschen takes special requests – add in the next step! Hotel Moselschlösschen accepts these cards and reserves the right to temporarily hold an amount prior to arrival. Waiting for service to check in, slow service in cafe, lack of food options when arriving just after lunch slot. Wifi. Every time need to log-in when re-entering the network is very annoying. The room was rather small for the price; the price indicated at the reception desk was somewhat lower than what we have payed through booking.com. Always some cooking smell in the bedroom-building. No door in the shower. Bathroom full of water after shower. Hotel could provide information about day trip to Trier and easily accessible train service. Discovered possibility on our own.